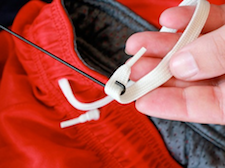 The Daily Grommet posted a wonderful item that helps you restring hoodies. I know I have several hoodies hanging in my closet that need to be restrung and I gave up because it's so difficult. This tool makes it easy and painless. It can also be used for unclogging drains and vacuums.